Medicare has long been underfunded in Puerto Rico. Americans on the Island pay the same Medicare payroll tax as mainland citizens but receive the lowest level of federal Medicare spending in the country. Federal underfunding of Medicare Advantage (MA) in Puerto Rico is contributing to a health care crisis in the wake of Hurricanes Irma and Maria. The situation worsened in 2010, when Congress linked MA funding to Medicare fee-for-service spending. Hurricanes Irma and Maria further strained the health care situation in Puerto Rico with the devastation they left behind. With nearly all medical facilities suffering damage or being destroyed, quality care became even more scarce. As a result, thousands of physicians have fled the Island, creating a crisis of access. The Puerto Rico Integrity in Medicare Advantage Act (PRIMA) would stabilize Medicare Advantage payments and incentivize doctors to return to Puerto Rico. H.R. 6809, sponsored by Rep. Gonzalez-Colon (R-PR-At Large), makes important adjustments to the MA payment formula for a period of three years, helping health care recovery efforts in the aftermath of Irma and Maria. 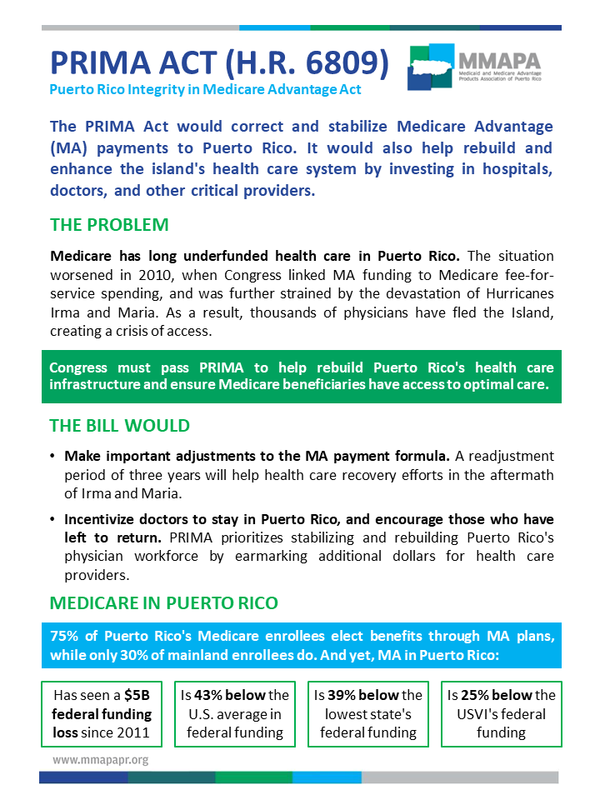 PRIMA would also incentivize doctors to stay in Puerto Rico and encourage those who have left to return by restoring funding to the MA program and directing 50 percent of new funds directly to providers and bolstering MA’s ability to deliver a high-quality, coordinated care model to more than 580,000 of the most vulnerable Puerto Ricans.